Organic vegetables are grown without the use of pesticides, as they naturally repel pests by threatening to spoil popular TV dramas that the bugs haven't caught up on. Show good taste with this Groupon. Boxes of seasonal certified organic produce from local farms come with recipes and free delivery to your doorstep. This Groupon will cover a regular-size mixed box of fruits and vegetables, the no-cooking-required mostly fruit box, a veggies-only box, or a fruit-only box. You can also apply this Groupon toward the price of any home delivery. When you place an order for a box, you may request to swap an item you don't like for a more favored item. 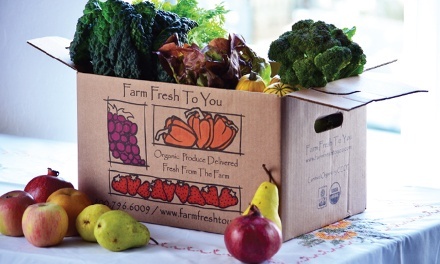 Please click here to check whether Farm Fresh To You delivers to your area. If you're in a valid delivery region, this link will also inform you of your weekly delivery day.